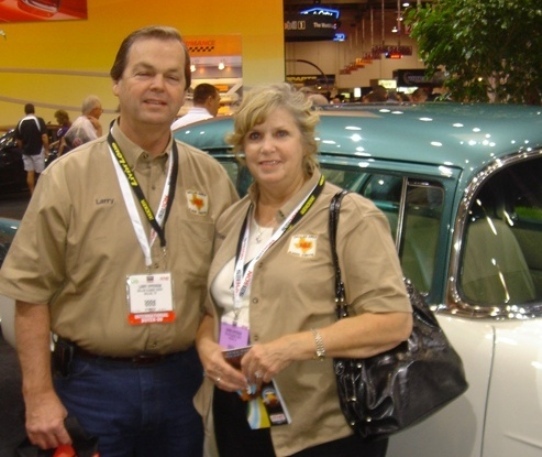 The story of Larry & Dianne Epperson's fabulous trip to Vegas for the legendary Sema Show! It began in 1963. SEMA (Speed Equipment Manufacturing Association) was a fancy name for an association of hot rod part makers. SEMA began when a group of Southern California aftermarket manufacturers with names like Edelbrock, Moon, Weiand, Iskenderian and Hedman among others formed an association that now is called the Specialty Equipment Market Association and is still referred to as SEMA. That small group of manufacturers that banded together has grown today to be over 7000 companies worldwide representing aftermarket manufacturers, original equipment manufacturers, media, car dealers, specialty equipment distributors, installers, retailers and restoration specialists. The association today represents a $32 billion a year industry with products that include performance and racing components, cosmetic and functional accessories, wheels and tires, mobile electronics, safety products, restoration parts, handling equipment, drivetrain parts and more. The association has far exceeding the dreams of the original group of hot rod manufacturers that banded together in 1963. Each fall in Las Vegas, the ‘SEMA Show’ is held and it is HUGE. The event has grown to be the largest convention to be held in Vegas each year, overtaking the old computer trade show called Comdex. Anyone and everyone involved with the automotive industry make SEMA their big trip of the year. This show is not open to the public and registration is restricted to the media, manufacturer, buyer or exhibitor. However, as a member of the SEMA SAN group (SEMA Action Network), the DACC has relationships that can open doors. This door was opened for club members Larry and Dianne Epperson when they expressed a desire to attend this legendary event. Following is Larry’s recap of his experience at the 2009 SEMA Show. The SEMA SHOW - ‘EYE CANDY’ for anyone who likes anything with wheels. My wife Dianne asked, “What would you like to do for our wedding anniversary this year?” Well, it was August and like most men I hadn’t given that much thought. Dianne asked, “Well, would you like to go to SEMA this year. You’ve always wanted too.” My response without any hesitation, although somewhat caught off guard, was sure, YES sounds great! The next challenge was to find a place to stay and a flight to Vegas. Now, we were 8 weeks away and at first check, lodging was not a problem, “I’ll confirm later” I thought. Looking at the SEMA show schedule, I noticed that on Wednesday morning of the week long event, they had an NHRA breakfast with six past greats and one of my favorites. So now the rush was on. The breakfast line up was Bill “Grumpy” Jenkins, Shirley Muldowney, Bob Glidden, Don Prudhomme, John Force and Don Garlits. So, maybe I had better get a flight and a room NOW! It was four weeks off now, and the hotels were FULL, Ooops! Well, the Paris had one room left and we took it. Checking in Tuesday and out Friday, mission accomplished! Well, I wanted to be there Tuesday early enough to see a little of Vegas and also be sure to be in time for the breakfast Wednesday morning. You would think that finding a flight to Vegas of all places would not be a problem, WRONG!! Well, after several phone calls we found a 7:30 AM flight on U.S Airways. I signed up for the breakfast and now the wait was on again! Over the next few weeks I made daily inquiries to the SEMA website checking to see if they had received my request and contacted David to see if he had heard anything. David’s comments over the next weeks were not to worry, we would get the badges. Finally the SEMA website showed our badges were approved but not shipped. David said just plan to pickup your badges at the front desk, and since I had a tendency to lose things I thought this was probably a good idea. Well, one week left and our badges arrived at our house. SUCCESS and I could rest, although David gave some us some contact names just in case. It was time now and we spent the last night getting packed with proper attire, we thought, for the week’s events. Badges and breakfast tickets packed, we were ready! The alarm rang and it was 4 AM. We were up, dressed and headed to the airport. I’ve made pre-arrangements for parking so all was good. We shuttled directly to the gate, passed through security and before we knew it, it was 6 AM. It didn’t take as long as we had anticipated so a little airport breakfast was next and then the waiting game. We started to board a little after 7 and the plane was ‘packed’ with a pretty even breakdown of Vegas, rodeo, business & SEMA travelers. We left Dallas at 7:30 AM and arrived in at 8:08 AM Vegas time - pretty quick! We got to the hotel and but the room was not ready and would not be ready until after 3:00 PM. We decided to check our bags and grab the shuttle to SEMA. We got the badges out of our suit case, checked our bags and were gone, right? “Dianne, do you have the badges?” No, you had them in your hand at the concierge desk. They must have been in the suit case. We went back and retrieved our bags, NO BADGES! Now we back tracked our last few steps without any success in finding our badges. Being just a ‘little’ upset, we hopped on the SEMA shuttle bus and headed to the show not knowing what would happen when we got there. I was preparing a speech of excuses, as we went. There was a check-in area, and a very long line, but since we were pre-registered it was not a problem. We got new badges and after a brief cool down period we were in the show! (I’m embarrassed to admit but just to let you know that if it should happen to you, all is not lost) We hung our badges around our necks and headed out to see what SEMA was all about. We started in the tire section and there was a whole building full of tires, street, drag racing, short, tall and extremely tall and some very wide. Holy Cow this is going to be more than I dreamed! It was a busy first day! We would do better tomorrow! Wednesday came with a very LOUD knock on the door, it was 5 AM and I was wondering if someone was breaking in! Dianne said, “Oh, that’s my coffee call!” I opened the door and sure ‘nuff the coffee had arrived! Well, I needed to get up early anyway since this was the day of the NHRA breakfast that I had been looking forward to! We enjoyed our coffee and I wanted to get there early to get a good seat to see the drivers and hear everything. The breakfast started at 7:30 A.M. and we got to the Las Vegas Hilton a little before 7. The room had a very long line of very early risers, but they were still coming in! Doors opened at 7:30 and we started filing in. The ‘breakfast’ was coffee, juice & donuts. We grabbed a plate of food and found a seat in the center of row four, not bad. The entertainment for the next few minutes was shown on 2 large projection screens showing drag races of the past years with dragsters and funny cars smoking the tires the full quarter mile. Times have changed and while a 6 second dragster was winning National events back in those days, at today’s events it takes a 4 second pass just to qualify. These are the racers I remember as I was growing up, shoestring budgets racing out of their pockets. There were no million dollar budgets, and very little television time so the monthly HOT ROD magazine kept me informed. NHRA announcer Bob Frey came out and welcomed everyone with a brief history of motor sports with the emphasis on today’s guests and drag racing. Next were the driver introductions. The introductions were great and well thought out. Bob started the introductions as the two large screens showed each driver, their cars, races, awards and old interviews of each. First out was Bill ‘Grumpy’ Jenkins. His picture flashed on the screen, his record wins and specific races and then out he walked. He took the microphone and began a brief review and thanked the crowd for having him. Next was Shirley Muldowney, then Bob Glidden, Don Prudhomme, John Force, the only ‘active’ driver. He, of course, took the microphone and began a 30 minute talk about how he always wanted to be ‘cool’ and have the swagger of Don Prudhomme. Bob calmed John down so that they could continue. Next was the introduction of the #1 driver, Don Garlits. For the next hour or so, each driver took jabs at each other, talked of their accomplishments, and in most cases admired the accomplishments of others. The only real slams seemed to be between Shirley and Don. She really dumped on him several times! John Force said, “I wish the audience could have been back stage to listen to all the non-repeatable comments that were made before coming out on the stage.” Bob Frey’s final request was for each driver to tell which of their cars were their favorites starting with Bob Glidden and ending with Bill Jenkins. I checked the website of each these driver and there were some pretty impressive videos of their races. For example; one of Bob Glidden’s races, he rolled his Ford Thunderbird 6 ½ times at 185+mph when a parachute malfunctioned. The first thing he did after the NHRA Safety Safari pulled him out of the wreckage was to take off his jacket and ‘cover his homemade intake manifold’ …. Speed Secrets! A note: Bob Glidden left Vegas and had open heart surgery 5 hours later. He is doing fine and said that he would not have missed the breakfast for anything. In that same area, I noticed a very neat looking ‘55 Chevy. A closer look revealed that this was the GM Performance Parts E Rod ‘55 Chevy! This ‘55 is equipped with the eco friendly 430 HP small block produced by GMPP that will pass all emission requirements in California and can be used in all newly built classics, hot rods etc. This engine meets or exceeds all of the emission requirements for the state of California. This is a very neat installation and with the purchase you get the complete system all the way down to the accelerator pedal. The rest of the day we continued to look at the show cars, paints, parts and new products that were or would be ready to market in the near future. We finished Wednesday afternoon watching the road race. This consisted of trucks jumping on temporary dirt track set-up outside. There was a whole area outside open to the public that had a lot of the same items that were inside plus several cars, show, custom, race and trucks outside in the non restrictive area. The Meguiars television show called ‘Car Crazy’ was also in that area and open to the public where Barry Meguiar was recording interviews for his television show. Thursday morning, the 5 AM knock on the door didn’t scare me this time. It was the coffee guy! We got ready and headed to the shuttle for another day at the show. This time we were early and had to wait for the doors to open at 9 AM. We grabbed a quick breakfast and headed to the hot rodding area. A large crowd had gathered and we noticed Chip Foose was signing autographs. I jumped in line and only to be told that I am one out, too late. I found Dianne and she was standing along the wall in a line. Yes, it was another Chip Foose line. In the mean time, a friend called and asks me to find out about the 2x4 EZ-EFI set-ups. I went over to the Comp Cams display and talked to one of the reps. Finally, I handed over the phone to speak directly to my friend in Fort Worth. Then, back to the line and in another 30 minutes or so we were standing in front of Chip. He signed my hat, with a ‘32 Ford sketch then Dianne’s shirt. THIS IS ONE NICE GUY! I’m not sure he realized how popular he is although I could not see the end of the line wanting to meet him. He spent a good 15 minutes visiting with us and taking a few pictures. 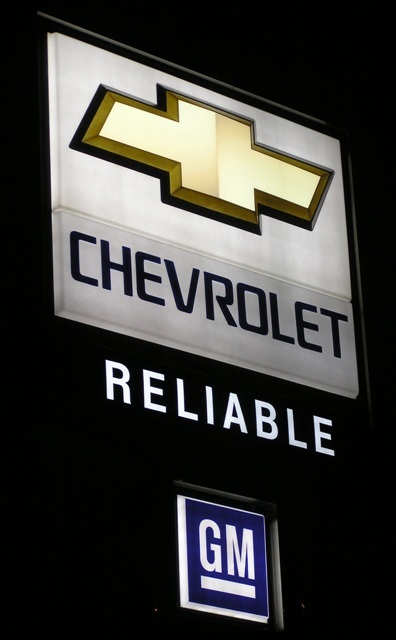 David Graves had contacted me to spend a little more time at the E Rod ‘55 Chevy, so back over to that area. I met with Steve Felix, Engine Group Manager, Performance Division Engine Teardown, Durability of General Motors. He was one of the engineers who worked on the design team. Steve was very informative, gave me his card and told me that if any of our members wanted additional information to please call. One additional point was that several installations were using the ‘Hi-Performance’ catalytic converters only, no mufflers which in his opinion was quiet enough to pass inspection, (unless you stand-on-it.) The system is pricey now but we can hope that it will drop below the $8000 price tag in the future. If you have to have it, like in California, you just dig a little deeper in your pocket. We continued our walk around looking at all the cars and parts stopping by the MSD area one more time. Standing there was Dennis Anderson, the owner/Driver of the Monster Truck, GRAVE DIGGER. Well, this was another picture opportunity and again this guy is all class. He was very friendly and my grandkids were very envious (me too). We had a short conversation concerning the monster truck series and how ‘kid friendly’ it is. Moving into another part of the convention center there was a ‘New Products Area’ where products were displayed in glass cases and a few out on tables where you can pick them up and take a closer look. Each product had a Bar Code on the glass. They issued you a scanner and you scanned the bar code, turned it in and information was down loaded and handed back to you or sent to your computer. The rest of Thursday I tried to make sure I saw everything and this was the same procedure we followed Friday, our last day. We left Friday night on a very crowded flight and I didn’t think we would ever land. Once on the ground, we hurried to the truck, to home and in bed at 2 AM. A week later I was beginning to recover! 1. 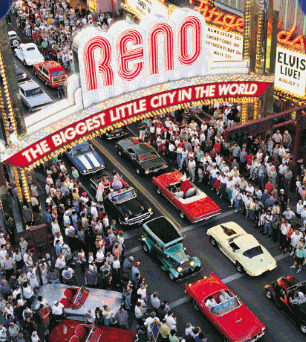 Book your room early – 6 months is not too soon and SEMA has pretty good rates set. 2. Book your Flight reservation early. 3. Wear very comfortable shoes. You will walk ‘miles’. 4. The dress code that is listed is NOT enforced so wear something comfortable. It was hot while we were there. Jeans, shorts & tee shirts were worn by 30%? 5. Of course, wear your-DALLAS CLASSIC CHEVY SHIRT - people notice! 6. By all means pick up the daily paper - it has all the times & locations of appearances, meetings & displays. Now .. would we do it again? HECK YES! PHOTOS FROM THE 2009 SEMA SHOW!